What Did You Hear On the Roof in Tanzania? “Hey, do you want to watch the Discovery Channel?” I asked Brad. He smiled. I yanked open the curtains, and a Vervet Monkey jumped off our metal roof onto the branches in the garden. “Let’s sit on the veranda to watch.” We gathered our elephant and rhino coffee mugs and tiptoed out the door. One saw us. It bounded back across the branch and onto the roof. A minute later a black face peered over the edge. Its juvenile head upside-down, his shiny black eyes examined us, and it returned to the trees. It is a young one. My friend recommended that we name the monkeys even though I cannot identify individuals yet. The babies shall be Huey (Hew-ey), Luis (Lew-ey), and Dewey. The juveniles that wrestled on the roof shall all be “Bueller,” in honor of Ferris (Ferris Bueller’s Day Off). “And the adults?” I asked. She suggested mischievous adult names. I suggested we use mafia movie names because they steal fruit and threaten people. Yup. I said that stereotype today. I suggested that all the best movie spies are named Natassja. “She’s the one peeking over the roof, obviously,” my friend wrote. We agreed that we must be crazy to be naming monkeys that we can’t identify. I looked up from my breakfast and stared at my partner. "A monkey? Was that a monkey on the roof?" A metal roof transmits insane noises, but of this I was sure. The unmistakable gate of a two-legged run had just passed overhead. Either a toddler was up there or a monkey. I slid into my grey and white striped robe and black reef sandals and rushed out the screen door. 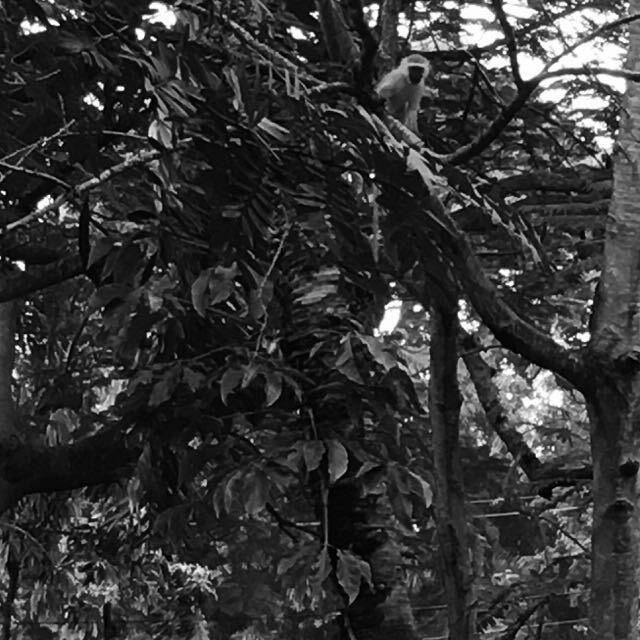 I turned the corner of the house, and sure enough, there were Vervet Monkeys in my trees! One saw me. It scooted higher in the tree where it sat in the crook of a branch and consumed the fruit it had picked. Branches swayed and cracked in the neighboring yard as well. The monkeys shot from limb to limb. Some were gathering fruit and dropping it on the ground; others were peeling back rinds and consuming the bright citrus inside. I inched closer to photograph a tiny one, but I discovered a few mothers headed my way and I retreated. Peering in my kitchen window. I retreated to my breakfast table indoors and texted my friend in New Zealand, a woman that loves animals as much as I do, "A monkey just ran across my roof." She responded, "Cool. You don't get to say that every day." On the one hand, if you're me, you don't. On the other hand, if you’re me and in Tanzania, maybe I will get to say that every day. I wrote that July 3. We had lived here about two weeks. It’s now November 3. My Swahili is improving; my monkey sightings are increasing. This morning I told the house staff, “nimependa kuona tumbili” (I like to see monkey). We’ve been told that the troops move with the rains. The rains have pushed them down from the mountain into our village, so perhaps we will hear them more often. Next time I hear the pitter-patter of little feet on the roof, I’ll grab my camera rush outside and wait for Natassja to peer over the edge. On November 1 I asked myself What do I want from my life in Tanzania? Today, my answer to that question is “encounters;” I want encounters with the wildlife, culture, and society that expand my soul and add chapters to my book of experience.